Gamakatsu's G-Finesse Tournament Grade Drop Shot Hook was developed by Professional Angler Aaron Marten. 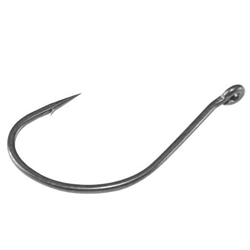 This hook features a point that's slightly angled out for optimum effectiveness along with the Gamakatsu's exclusive Tournament Grade Wire that has 20% less diameter for easier hook penetration without any loss of hook strength. The G-Finesse Drop Shot Hook also features Gamakatsu's proprietary Nano Smooth Coat, a finish that's slick with less resistance than conventional hooks.